Two of the men behind the all-new MV Agusta F3 are months away from finishing work on the bike and reckon it can radically shake-up the supersport class thanks to a powerful three-cylinder engine, advanced electronics and low weight. MCN was granted exclusive access to the MV Agusta Research and Development team at the Varese factory last week where Technical Director Marco Cassinnelli and head of production Andrea Coggi explained what is happening to the F3 and the naked B3 Brutale version which will follow shortly afterwards. Why are they talking about a new bike so early? Unlike most manufacturers, MV Agusta is happy to talk about the new bike way ahead of the official launch in November. It has no current bike that revealing tantalising details of a new bike will instantly kill off. We know the bike is a ground-up new bike. It’s got a 675cc inline three-cylinder which has a counter-rotating crankshaft; the first time one has been fitted to a supersports production engine; the same as that fitted to the MotoGP Yamaha YZR-M1 ridden by World champion Jorge Lorenzo. The idea behind the counter-rotating crank is to improve the way the bike turns in while the revs are higher as it reduces gyroscopic effects of the crank and the wheels turning. What’s the B3 Brutale all about then? The B3 Brutale is being timed to come out a little while after the F3 but that project is already well ahead too. The naked version of the F3 will share the same basic engine layout but will have a different camshafts, valves and ignition to produce 120bhp at 13,000rpm and 57lb ft of torque. The engine will share the cases, gearbox, counterbalance shaft, crankshaft and conrods. The styling of the bike is still a heavily-guarded secret but the finished bike will be seen at the Milan motorcycle show in November with the bike going into production in early 2011. 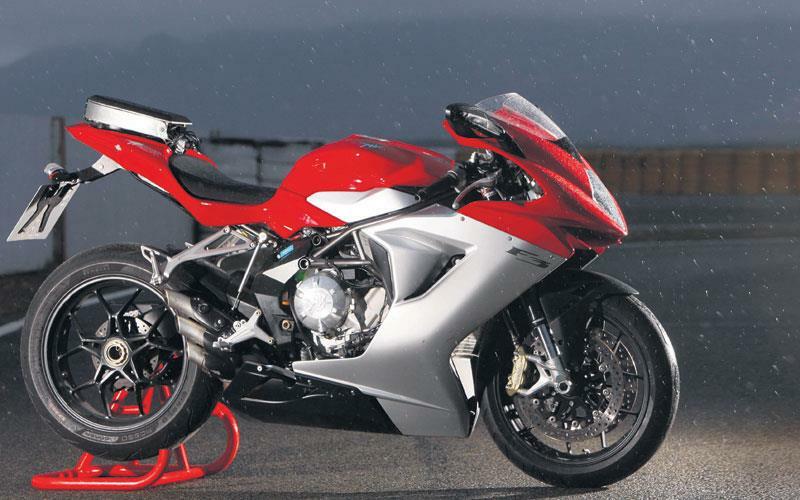 MV Agusta F3 first ride: "tiny, loud and angry"